Welcome to von Halterbach*AT. We are a small norwegian forest cat cattery in lower Austria. Please excuse that not all the information is available in english. You may use the google translator under the navigation bar. If you have any questions you are welcome to call me or send an e-mail. We are a member of KKÖ, FIFé registered. 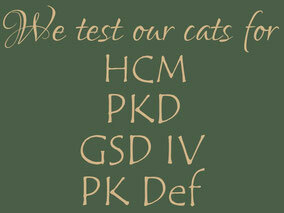 Our breeding cats are GSD IV and PK Deficiency negative and scanned for HCM at regular intervalls. Our cats have got a catrun so that they can go in and outside whenever they want to. Take a look at the pictures. You may take a look at snapshots of our cats and kittens too. If a kitten is going abroad it leaves our home additionally with the blue EU-passport for cats and a vaccination against rabbies. I prefer to meet the new owners before or when the kitten will leave our home. My goal is to find the most suitable home for each kitten, based on its needs and personality. I would also love to get pictures and reports from their new homes - even when the kitten is grown up.